Worldwide most-selling and most liquid gold coin, American Gold Eagle (since 1986 sold over 13 million pieces) we offer to you in 1/4oz denomination. This denomination will attract not only small retail investors. For slightly higher premium you gain new possibility to diversify and work with your investments, compared to standard 1oz coin. American Gold Eagles are minted in West Point, New York in 4 denominations: 1-oz, 1/2-oz, 1/4-oz and 1/10-oz. These 22-karat coins contains 91.67% of gold and 8.33% of silver and copper. 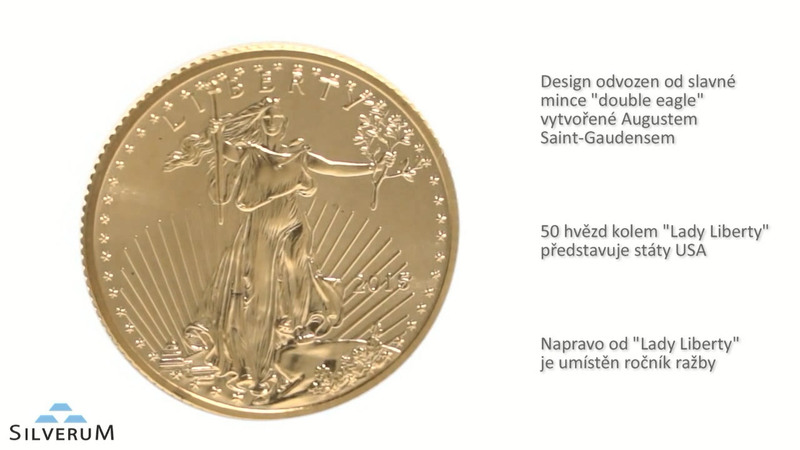 Coin with weight 8.483 g contains exactly 1/4 oz of gold, what is certified by US government. Additional alloy of silver and copper produces coin more wear-resistant. American Gold Eagle is US legal tender coin. The obverse design features a rendition of Augustus Saint-Gaudens' full length figure of Lady Liberty with flowing hair, holding a torch in her right hand and an olive branch in her left, with the Capitol building in the left background. The reverse design, by sculptor Miley Busiek, features a male eagle carrying an olive branch flying above a nest containing a female eagle and her hatchlings. Gross weight: 0.2727 oz (8.483 gramů).